It’s cold out in Chicago. And not just the usual winter cold, but record-setting cold. And when the temperature gets that low, when you mix in a little bit of wind, it can become dangerous very quickly. 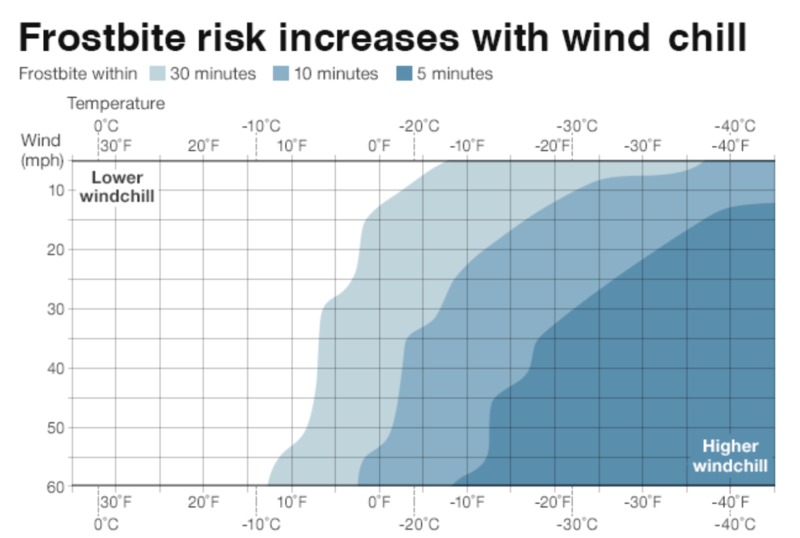 In an article about the weather conditions in the Midwest, the BBC included this graphic at the end. Even the slightest bit of wind decreases the time one has before frostbite sets in. So wrap up and stay warm, everyone. Christmas time is a time when people receive gifts. Well this year was no different and I received a few. One, however, was in a box stuffed with old newspaper pages. And it turns out one of said pages had a graphic on it. So let us spend today looking at this little blast from the past. 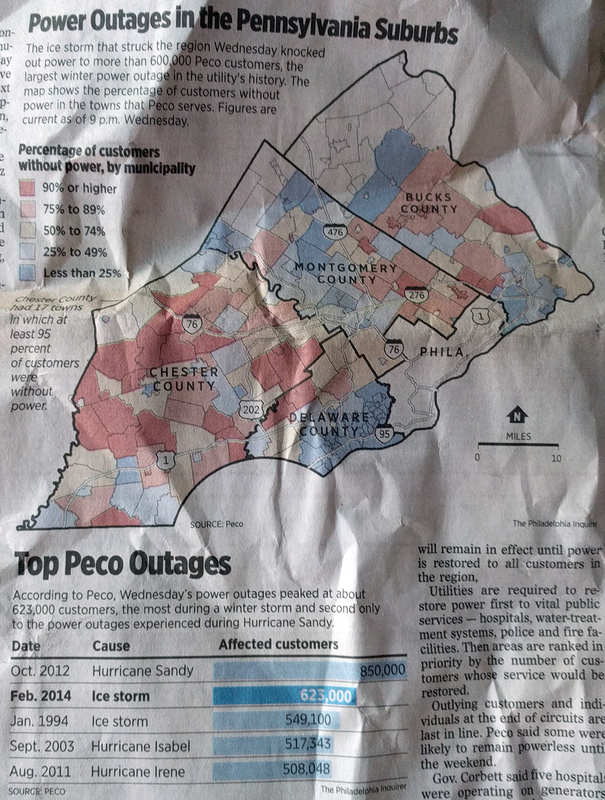 The piece looks at PECO outages, PECO being the Philadelphia region’s main electricity supplier. The article is full page and is both headed and footed with photography, the graphic in which we are interested sits centre stage in the middle of the page. The choropleth works, but I question the colour scheme. The bins diverge at about 50%, which to my knowledge marks no special boundary other than “half”. If that yellow bin represented, say, the average number of outages per storm or the acceptable number of outages per storm, sure, I could buy it. Otherwise, this is really just degrees of severity along one particular axis. I would have either kept the bins all red or all blue and proceeded from a light of either to a dark of either. I probably would have also dropped Philadelphia entirely from the map, but I can understand how it may be important to geographically anchor readers in the most populous county to orientate themselves to a story about suburbia. Lastly, I have one data question. With power lines down during an ice storm, I would be curious to see less of the important roadways as the map depicts and other variables. What about things like average temperature during the storm? Was the more urban and built-up Delaware County less susceptible because of an urban heat bubble preventing water from freezing? Or what about trees? Does the impact in the more rural areas have anything to do with increasing numbers of trees as one heads away from the city? Those last data questions were definitely out of scope for the graphic, but I nevertheless remain curious. But then again, this piece is almost five years old. Just a look at how some graphical forms remain in use because of their solid ability to communicate data. Long live the bar chart. Long live the choropleth. Credit for the piece goes to the Philadelphia Inquirer graphics department. You may recall a few weeks ago there was a hurricane named Florence that slammed into the Carolina before stalling and dumping voluminous amounts of rain that inundated inland communities in addition to the damage by the storm surge in the coastal communities. At the time I wrote about a New York Times piece that explored housing density in coastal areas, specifically around the Florence impact area. Well today the New York Times has a print graphic about something similar. It uses the same colours and styles, but swaps in a different data set and then uses a small multiple setup to include the Florida Panhandle. Of course the Florida Panhandle was just struck by Hurricane Michael, a Category 4 storm when it made landfall. This one instead looks at median income per zip code to highlight the disparity between those living directly on the coast and those inland. 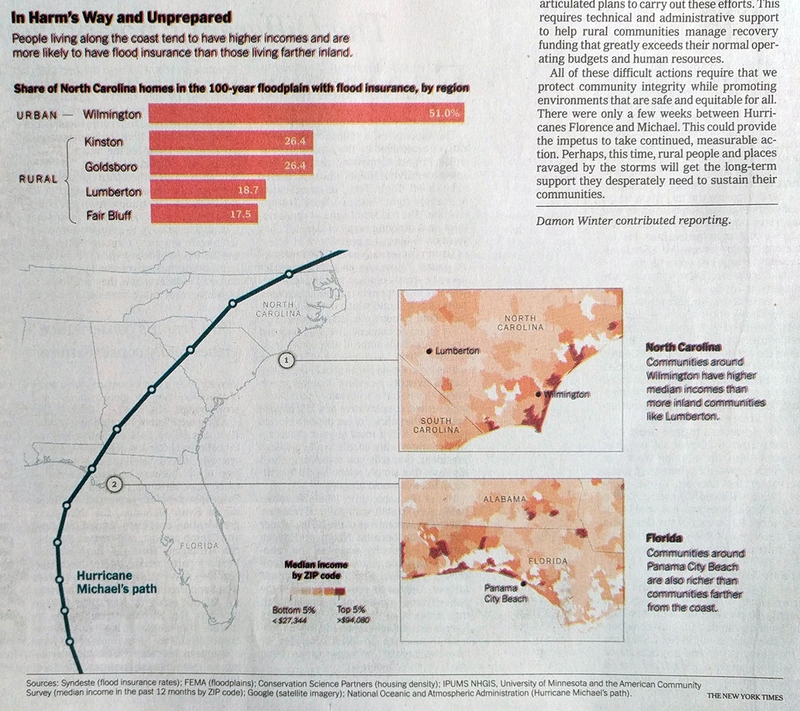 In these two most recent landfall areas, the reader can clearly see that the zip codes along the coast have far greater incomes and, by proxy, wealth than those just a few zip codes further inland. The problem is that rebuilding lives, communities, and infrastructure not only takes time, but also money. And with lower incomes, some of the hardest hit areas over the past several weeks could have a very difficult time recovering. Regardless, the recoveries on the continental mainlands of the Carolinas and Florida will likely be far quicker and more comprehensive than they have been thus far for Puerto Rico. The only downside with this graphic is the registration shift, which is why the graphic appears fuzzy as colours are ever so slightly offset whereas the single ink black text in the upper right looks clear and crisp. During my travels in Europe, I enjoyed very little sunshine. It did not rain often, but the skies were overcast in both Scandinavia and London. Turns out that at least in January, after my trip, Europe was covered in an inordinate amount of sunshine. 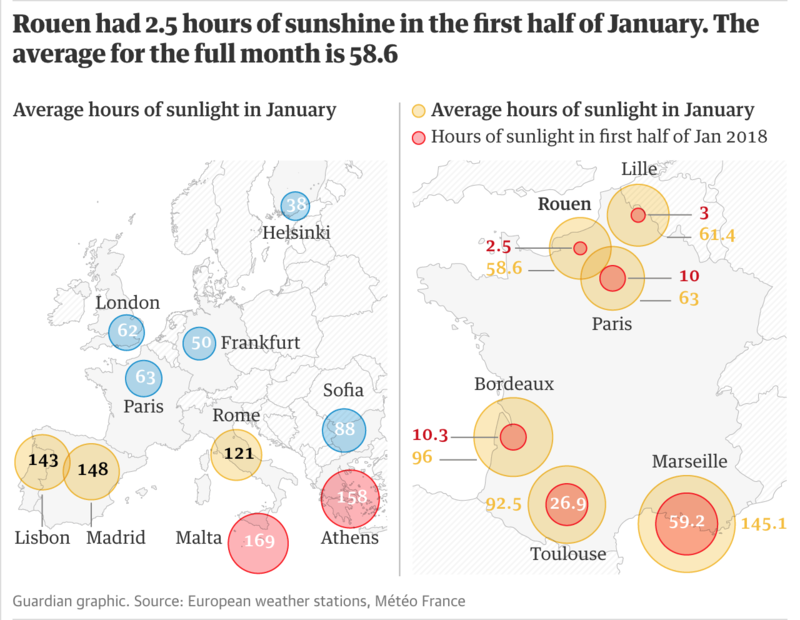 The Guardian covered the story, with a graphic showing just how little sunshine has been seen in northern Europe. Over the last several weeks we dealt with the impact of a few hurricanes from H to K, i.e. Harvey, Irma, Jose, and Katia. Now that the Atlantic basin has quieted a wee bit, it is time we get back to the lighter side of things. So we turn to xkcd and its look at ensemble models, often used to try and predict the paths of hurricanes. Like many Americans I followed the story of Hurricane Irma over the weekend. One of my favourite pieces of reporting was this article from the Washington Post. It did a really nice job of visually comparing Irma to some recent and more historic storms, such as 1992’s Hurricane Andrew. It can be difficult to truly compare hurricanes, sometimes they are small and compact, other times more dispersed. Irma was just big with lots of potentially destructive power spread out across a wide area, almost the width of the Floridian peninsula. The article uses several graphics—I am also quite partial to the satellite image comparison so check out the article—but this one is perhaps my favourite. It uses a colour palette that deepens in redness nearer the storm’s centre. This allows the user to compare the geographic area or footprint of the storms destructive winds. I wonder, however, what would happen if the designers had superimposed each graphic atop the other. It might have allowed for an even better comparison of size instead of having to have the user mentally transpose each hurricane. Still, a really nice graphic and visual article. Credit for the piece goes to Bonnie Berkowitz, Laris Karklis, Reuben Fischer-Baum, and Chiqui Esteban. 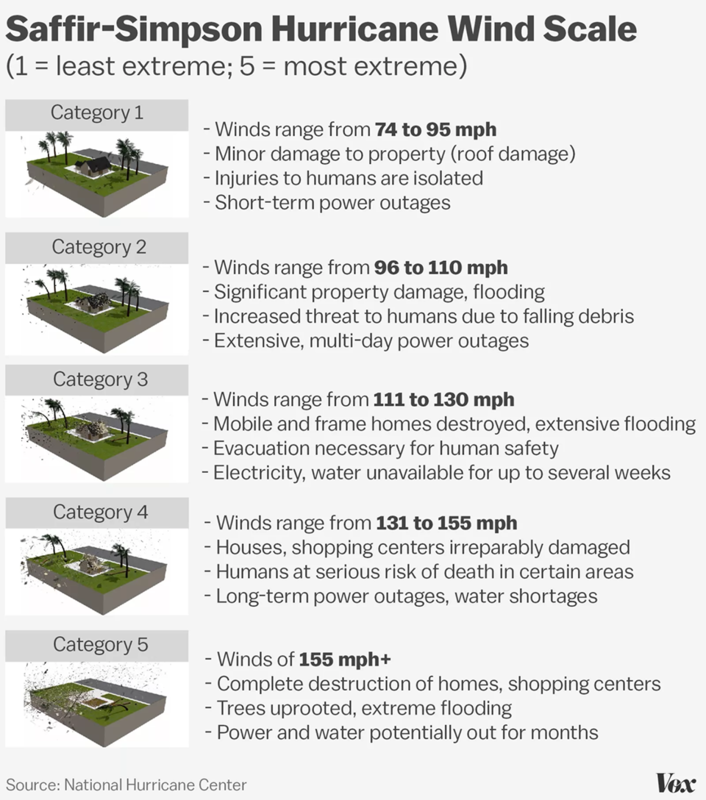 Author Brendan BarryPosted on 11 September 17 10 September 17 Categories InfographicTags Hurricane Irma, hurricanes, illustration, infographic, information design, photography, satellites, science, Washington Post, weatherLeave a comment on How Big Was Irma? Your author is on holiday today and is actually writing today’s post on a Thursday night train to Boston. But by the time he returns late Sunday night—a Monday morning post is not guaranteed—Hurricane Irma will have likely made landfall somewhere along the Florida coast. 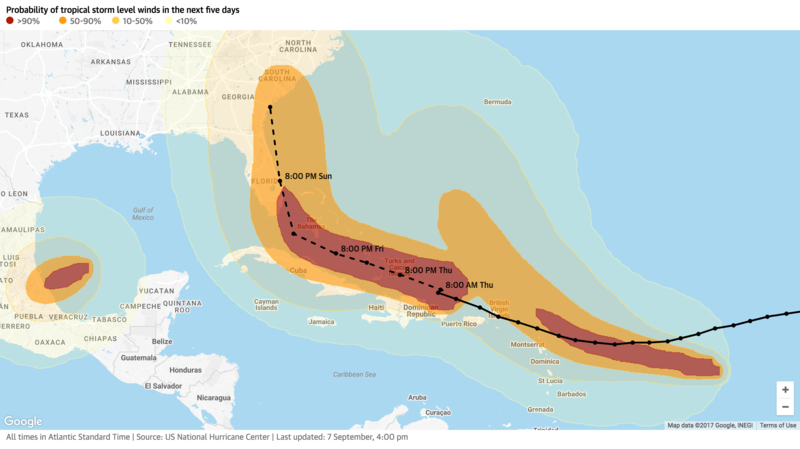 Thursday the Guardian published a nice article looking at the potential tracks for Irma. And while the specific routes will certainly be amended and updated over the weekend, the article is worth looking at prior to Irma’s arrival at Florida. As of my writing the track has shifted ever slightly westward and the current predicted path looks for Irma to land south and west of Miami. Ergo this screenshot is already a little outdated. The remarkable thing about this graphic, which is just a cleaner version of the standard meteorological maps through more a more considered palette, is that there is not just one path of winds, but three. Following quickly on the heels of Irma are Katia and Jose, the latter the one taking the nearly same path as Irma while Katia spins towards Mexico. But the graphic I really wanted to look at is the one ending the piece. This looks at the countries in Irma’s path as of Thursday morning. What I do not understand is the vertical axis of the bars. What does the height represent? To simply show the rank of countries able to cope with natural disasters, a more straight-forward table could have been used. A dot plot would also make some sense, but again, it would require an understanding of the underlying metrics driving the chart. The graphic is saved by the annotations, in particular the more/less vulnerable directional arrows. Because I do not understand why countries are grouped into the particular buckets, I find the coloured bins out of place. I think the concept of showing the most vulnerable countries is terribly important, however, the graphic itself needed a little more thought to be a little more clear in presenting the concept. 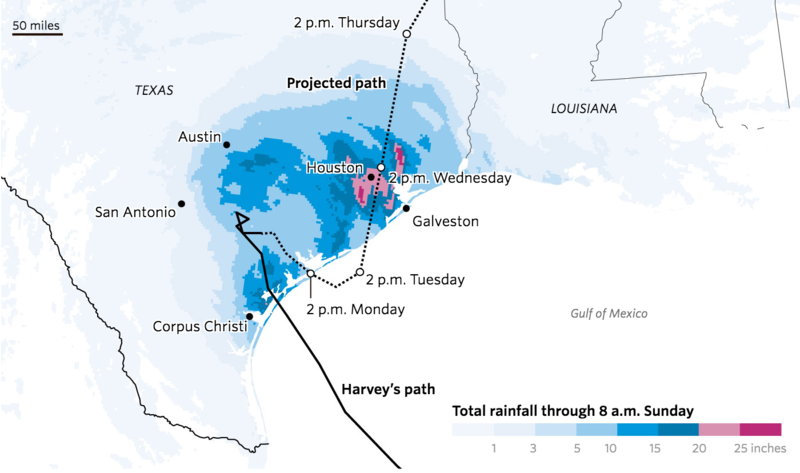 Yesterday we looked at the Post, Journal, and Times for their coverage of the fallen rain amounts in southeast Texas. But at the time, we only had actual totals from the Post and Journal. The Times had only produced a projection map. 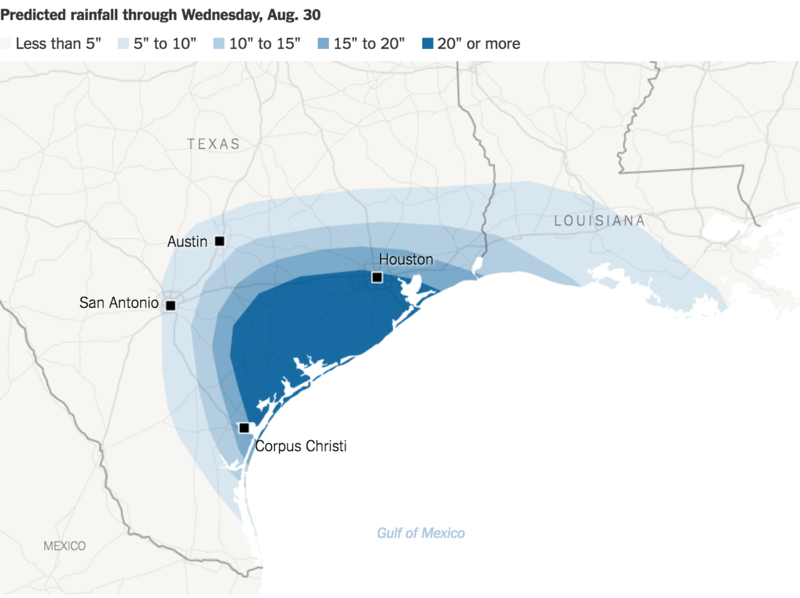 The Times piece yesterday was perhaps the most underwhelming of the three, though it certainly did some things correctly, namely it was small, simple, and quick to get the reader to the point that Houston was likely to be flooded by storm’s end. Well that had changed by the time I got home last night. What is different about this piece? Well this one is an animated .gif showing the cumulative rainfall. In other words, Texas starts dry and every hour just makes the map bluer and bluer. An additional feature that I find particularly useful is the dot map, which indicates where the heaviest rain was falling in each hour. Especially early on in the event, you can see the bands of rain sweeping in from the Gulf. The bins also work better here, though I wonder if more segregation or a different palette would have worked a bit better. But, my biggest critique is the same I have with many animated .gifs: the looping. And unfortunately I do not have an easy solution. You certainly need to see it loop through more than once to understand the totality of the rainfall. But then I really do want to be able to examine the final map, or at least final as of 03.00 today. Anyway, this was a really nice piece that should have been showcased alongside the others yesterday. Credit for the piece goes to Gregor Aisch, Sarah Almukhtar, Jerey Ashkenas, Matthew Bloch, Joe Burgess, Audrey Carlsen, Ford Fessenden, Troy Griggs, K.K. Rebecca Lai, Jasmine C. Lee, Jugal K. Patel, Adam Pearce, Bedel Saget, Anjali Singhvi, Joe Ward, and Josh Williams. Hurricane Harvey landed north of Corpus Christi, Texas late Friday night. 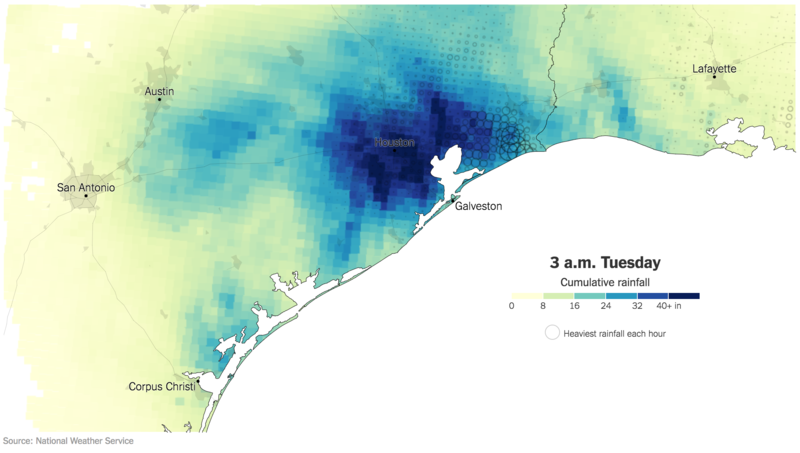 By Monday morning, Houston has been flooded as nearly two feet of water have fallen upon the city, built on and around wetlands long ago paved over with concrete. Naturally the news has covered this story in depth all weekend. Even leading up to it, when I was still posting eclipse things, various outlets had projections and why we should care graphics. But as the storm begins to move back into the Gulf—only to move back inland tomorrow—I wanted to compare some of the graphics I have been seeing. Of course, not all graphics are the same, let alone cover the same things. So this morning we are looking at just the rainfall total maps of a few different outlets. From the Washington Post, we have the following graphic. The palette chosen performs well at quickly scaling up to the record level of rainfall, i.e. the 20+ inches realm, but quickly shifting from the green–blue palette into dark purples. Then we have the Wall Street Journal’s graphic. Here we have a more familiar blue–red diverging spectrum. The point of divergence set to 20 inches. Lastly, we have the New York Times graphic. Though in this case, it’s not an exact like-for-like comparison. I could not find a graphic mapping total rainfall, instead this is for projected rainfall totals. But the design is for the same type of map, i.e. how much rain falls in a location. The Post takes the closest approach to the true continuous spectrum palette, where the shift from dry to drenched is gradual. It makes for a smoother, more blended looking map. Somewhere around that 20 inch point, however, the palette shifts from the green to blue range to purple. It emphasises the record-hitting point, but otherwise the totals are presented as more fluid. Perhaps correctly since rain does not neatly fall evenly into pixels. By comparison, the Journal segments the rainfall totals into bins of blues. The scale is not even, the lighter blues incorporate two inches, the darkers upwards of five. And then again, like the Post, separate 20+ as a different colour, here switching to reds. Lastly the Times keeps to a simple segmented bin palette of all blues. 20+ inches is rendered is just a dark blue. Each map has pluses, each has minuses. The Times map, for example, is simple and quick to understand. Southeastern Texas will be wet by the middle of next week. If your goal is only to communicate that point, well this map has done its job. It is worth noting, again, that this is a map of projections. Because the other thing missing from this map is the storm’s path. So if the goal were to showcase the rainfall along the storm’s path, well this graphic does not accomplish that nearly as well as the other two. The Post and the Journal both show the track of the storm. The Journal takes it one step further and plots its projected course through Thursday. This helps us really see if not understand the east side problem of hurricanes. That is, the eastern quadrants of hurricanes typically experience the heaviest amounts of rain. And as the darker portions of the map all fall to the north and east of those lines, it reaffirms this for us. So what really differentiates the two? The colour palette and its application. 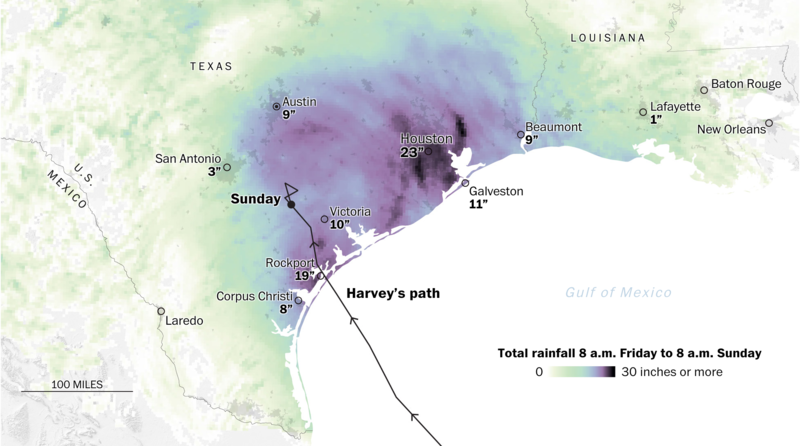 The Post’s palette is more natural as, again, rain does not fall neatly into bins and instead makes for blurred and messy totals across a map. Separating the heaviest rains into the purples, however, makes a lot of sense as that amount of rainfall, as we are seeing this morning, makes for a mess in Houston. But the point of a graphic is to translate nature and the observed into a digestible and pointed statement of the observed. What should I learn? Why should I care? The Journal, like the Post, does a fantastic job of splitting out the 20+ inch totals by using a divergent palette. But instead of blending into that colour, the distinction is sharp. And then below that threshold, we get rainfall totals segmented into just a few bins. These help the reader see, also more starkly because of the selection of the specific blues, just where the bands of heavy rain will fall. I do want to point out, however, that all of these maps occur in articles with lots of other fantastic graphics that visually explore lots of details about the story. And in particular, I want to highlight that the normal bit where I state the credits includes a lot of people. Creating a whole host of graphics to support a story takes a lot of work. Credit for the Washington Post piece goes to Darla Cameron, Samuel Granados, Chris Alcantara, and Gabriel Florit. Credit for the Wall Street Journal piece goes to Bradley Olson, Arian Campo-Flores, Miguel Bustillo, Dan Frosch, Erin Ailworth, Christopher M. Matthews, and Russell Gold. Credit for the New York Times piece goes to Gregor Aisch, Sarah Almukhtar, Jeremy Ashkenas, Matthew Bloch, Joe Burgess, Audrey Carlsen, Ford Fessenden, Troy Griggs, K.K. Rebecca Lai, Jasmine C. Lee, Jugal K. Patel, Adam Pearce, Bedel Saget, Anjali Singhvi, Joe Ward, and Josh Williams.